So we’re having a bit of a chocolate detox this week… With the warmer weather (we are pretending it’s not raining today…) I was ready for a change from a hot breakfast but clearly we are staying oat-based because duh. Homemade muesli is so much better than store bought for so many reasons. It has less sugar, you can make it just how you like it and pack it full of goodness and flavour. And it’s wahaaay easier than you think. I generally make it up with whatever is in the pantry and this time I just bought some dried figs so here we are! Take the base recipe and mix it up however you like – use maple syrup instead of honey. Add different spices, different fruits or different nuts. Your breakfast destiny is in your hands. Heat the oven to 180C (350F). 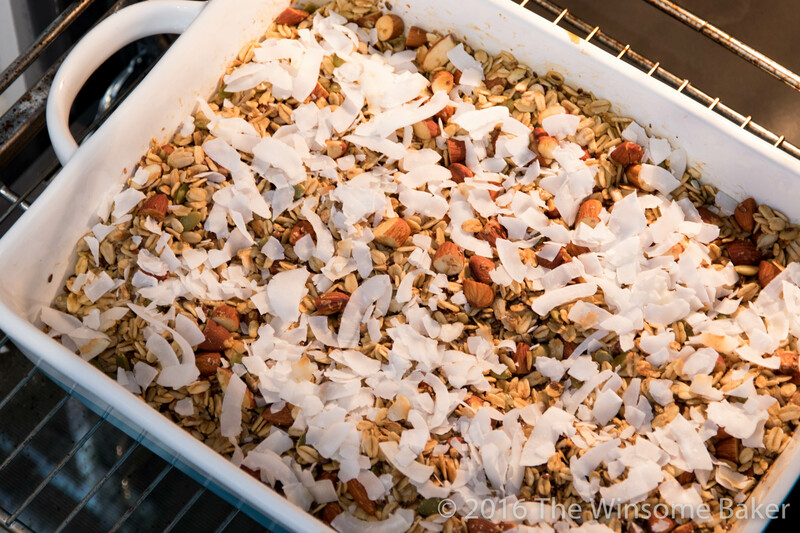 Pile the oats, chopped nuts, seeds and bran flakes into a large lasagne dish. A 9 by 13 inch pan is about the basic size to get it spread out okay. Mix the oil, honey, water, vanilla and cardamom together. If the honey is stubbornly sitting at the bottom microwave the mix for 20 to 30 seconds to melt it a bit. Beat it with a fork to get it combined nicely. Pour into the dish. Smoosh it all around with your hands until everything is covered with the goo. Spread the mixture out evenly and fluff it up a bit so it can toast easily. Bake for 30 to 40 minutes, stirring and turning it over every 10 minutes or so. When it looks almost done sprinkle over the coconut chips. The coconut needs less than 5 minutes to turn golden so watch it carefully! When everything is golden and fabulous, pop the tray on a wire rack to cool. Sprinkle over the chopped figs and stir in. Crunchy, nutty and fruity – a golden start to the day. 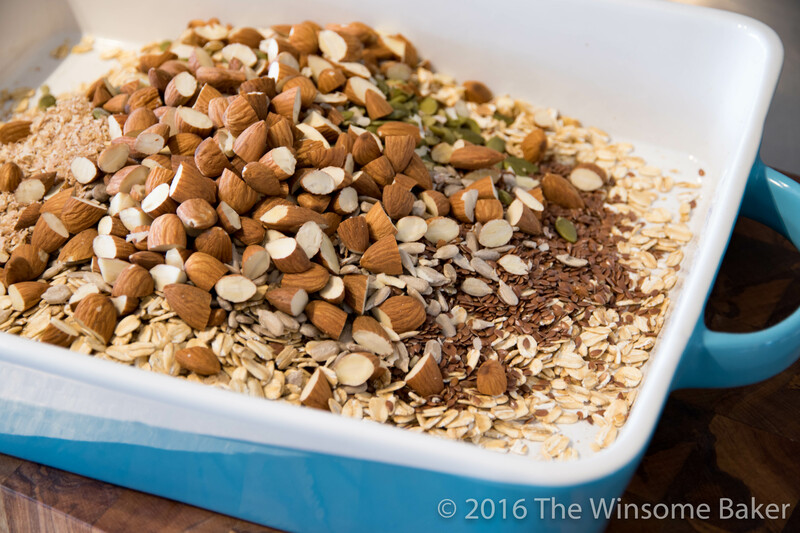 When the muesli has cooled completely transfer it to an airtight container to store.